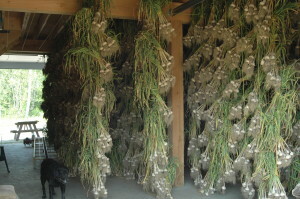 Garlic drying in a barn prior to cleaning and storing. Photo courtesy of Green Mountain Garlic. Learning how to store garlic is relatively easy and doesn’t change whether you’re commercially growing thousands of bulbs or just want your cooking garlic to remain fresh and viable for as long as possible. If you’re growing your own garlic, you’ll need to let your bulbs dry and cure after harvesting before you store them. While garlic is used in the kitchen, try not to store the bulk of your garlic there. The warmth and humidity can reduce storage life so many cooks keep their garlic stash elsewhere and bring garlic to the kitchen when needed for garlic recipes. Most growers hang freshly-harvested bulbs in bundles of 5-10 plants, with stems, leaves, and roots still attached. Garlic can be cured in any shaded area that is warm, dry, and well-ventilated; barns work great. Garlic typically takes 4-6 weeks before it is dried and cured, although this will depend on local conditions, humidity, etc. Once garlic is cured, stems and roots are cut away and any remaining dirt on bulbs is cleaned off, with the garlic now ready to be stored. 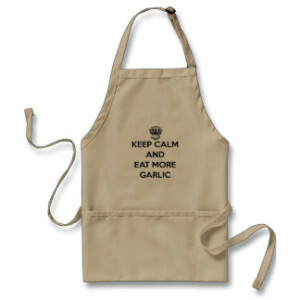 Garlic should be stored in a cool, dry place, optimally with a temperature of about 55F to 65F. While it does need some ventilation while being stored, many recommend storing garlic in an unheated area of your home, basement, or workshop that isn’t subjected to fluctuating temperatures from home heating and air conditioning systems. Brown paper bags and cardboard boxes work well to store garlic in, and bulbs should be placed loosely in both and not packed in tightly. Never store garlic in a refrigerator or freezer and try to store the bulk of your garlic outside of the kitchen if you frequently cook with garlic, as it’s best to bring in bulbs of garlic to the kitchen as needed since cooking areas tend to be warmer and more humid than other areas.